Home » Gold Cup , jamaica » Jamaica's Win Over USA Was Impressive, But Not "One of a Kind"
Jamaica's Win Over USA Was Impressive, But Not "One of a Kind"
As soon as the final whistle in last night's Gold Cup semifinal between the US and Jamaica was blown, the internet was flooded with a statement that read something to the effect of "Jamaica, first Caribbean nation to make the Gold Cup final". But while this is technically correct, it's basically like saying that Real Madrid had won the Champions League four times, not the ten they have under their belt. 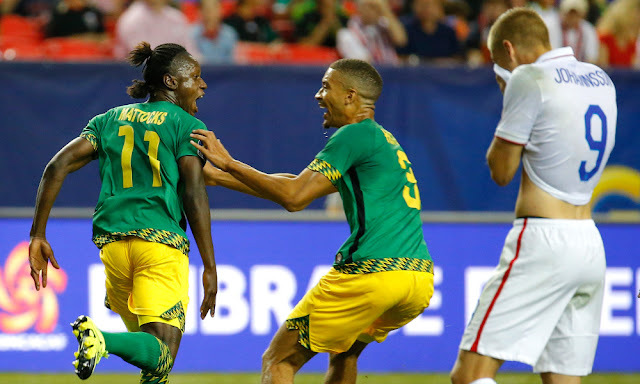 To make things clear, I am by no means trying to diminish the incredible achievement of the "Reggae Boyz", who will in fact compete in the CONCACAF title match for the very first time in the nation's history. After a 2-1 shock win over the United States of America, the Jamaicans will face Mexico who had won their semifinal clash with Panama just a couple of hours after Jamaica's match. Mexico has won the tournament more than any other nation in the region. But let's get back to this "first Caribbean nation" business. While the Gold Cup has been contested since 1991 under this particular name and brand, the CONCACAF title has been battled over since the inaugural CONCACAF Championship tournament in 1963 hosted by El Salvador. Ten such tournaments took place before the Gold Cup emerged in 1991. The 1971 tourney in Trinidad & Tobago saw the first Caribbean nation come in the runner-up spot. And while there was no actual final match as champions Mexico were crowned winners after coming atop the 6 team group, Haiti finished the tournament in second place, becoming the first Caribbean nation to finish in the top two. Two years later at the tournament hosted by tiny island nation Haiti, the home side finished first overall and were the first Caribbean nation to be crowned champions of North and Central America and the Caribbean region. 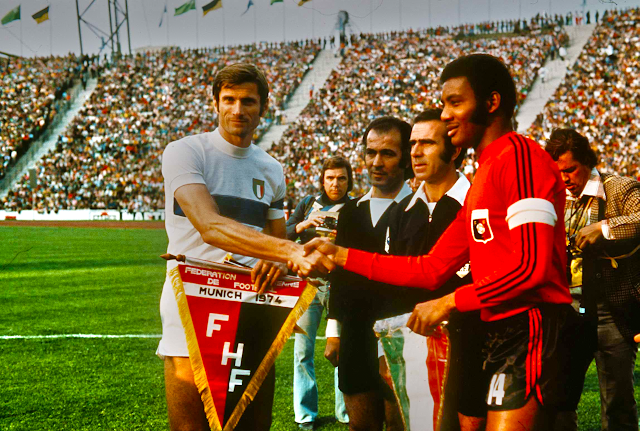 As a matter of fact, because of the World Cup implications of the tournament, the Haitians qualified for the 1974 FIFA World Cup in West Germany, although drawn into a group with Argentina, Poland and Italy saw Haiti finish their World Cup campaign without a single point. Trinidad & Tobago finished the 1973 CONCACAF Championship tournament in the runner-up position, two points behind Haiti effectively putting two Caribbean nations in the top two spots. Four years later in 1977 Haiti proved once more that a Caribbean nation can finish high up in the CONCACAF region when they once more lost out to Mexico after coming in second place in the tournament. So in reality Jamaica is in fact the first Caribbean nation to make the tournament final, only because a proper final match now actually exists. But even if they manage to defeat the Mexicans in Philadelphia on Sunday, they will definitely not be the first island from the region to claim the tournament title.